“No dragons were harmed during the making of this album,” proclaims the band in The Shadow Cabinet’s sleeve thus putting to rest any fears the band’s idols and colleagues in Labyrinth or Rhapsody would have. Wuthering Heights’ new album is deceptively not a concept for a change, despite a name indicating otherwise and titles like Faith - Apathy Divine Part I and Snow - Apathy Divine Part II. Indeed, the new album of the Danish rockers is an amalgamation of disparate styles like rock, folk, progressive and some metal. Therein lies the problem. Bands that cannot commit and play an adulterous game of mix-and-match more often than not fail to muster enough talent to get it right, which is the problem here. Wuthering Heights is a band looking to the metal scene for support, but also features K&F (keyboards and female vocals), accordion, Hammond organ and violin. Labyrinth and Rhapsody might be good reference points, but so is Skyclad. 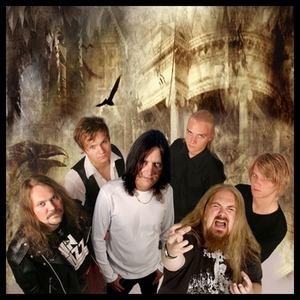 Wuthering Heights has the advantage of powerful and flexible vocals by Nils Patrik Johansson, which clearly lends character to the entire group, but the music is partly dreadful - the metallic parts notwithstanding. The contradictions are plain given how one guitar part might be of interest to Blind Guardian fans, yet the songs The Raven or Faith would not be out of the ordinary in an Irish pub. Add Korpiklaani to the list of related bands. The individual instrumentalists can play, but the album lacks power and laden under the influence of folk music and keyboards. Carpe Noctum - Seize The Night has guitars worthy of an Yngwie album and comes across as operatic, but the melody could belong to a children’s sing-along rhyme. Salt has turned out to be a bonafide tour-de-force in the annals of epic power metal. Leave it to the Danes to out guardian Blind Guardian. Dropping many hints and allusions to a concept involving water and sea, amidst a richly designed and sung album, it is the strong vocal delivery of Astral Doors’ Nils Patrik Johansson and the song prowess of the band members that delivers the album a notch above most album. Once again, Sensory Records has managed to import a European band that is deserving of its recording deal. Salt partly shines because of the aforementioned vocals, which is both powerful and expressive. Never caught with the wrong phrasing Johansson falls somewhere between Dio and Hansi of Blind Guardian while sailing his own course. The music is also something of a wonder. Truthfully, track after track demonstrates a band that can deliver in the songwriting department without going overboard technically or arrangement-wise. Every song is designed for impact without being simple or predictable. In that sense, the concept is clear: Salt is the work of artisans.